A dollop of dark chocolate filled with velvety nougat and topped with caramel crunch will surely make any valentine weak in the knees. On the search for the perfect delicious decadence, you’ll find a wide local selection. Our top five cover all the bases. The well-loved Xocolat Manufaktur’s workshop and retail outlet is located at their first home in the 9th. Look no further for classy, boxed delicacies filled with fine liqueurs and innovative ingredients like curry, Japanese yuzu lemon, horseradish or pumpkin seeds. For real aficionados, they even hold chocolate-making workshops. Some dealers in the sweet arts bring other cultural traditions to much-appreciated fruition in this confection-loving city. For years, Eduard V. Fruth has given Vienna a little piece of Paris at Fruth, his shop right off the Naschmarkt. Go for the éclairs, stay for the life-changing macaroons. If your mouth is watering for a 19th-century candy shop experience, there are two places of note. One is the evergreen Demel a candied work of art in floral-pattered wallpaper and delicate pastels. Joseph Hoffmann called its once owner, Baron Federico Berzeviczy-Pallavicini “the last romantic.” After the baron married Klara Demel, romance and candies found a permanent home on Kohlmarkt. The second (and much less touristy) choice is Lechanz, “Vienna’s Chocolate King.” Here Mr. and Mrs. Lechanz are the very active heads of what has become a chocolate-making institution. 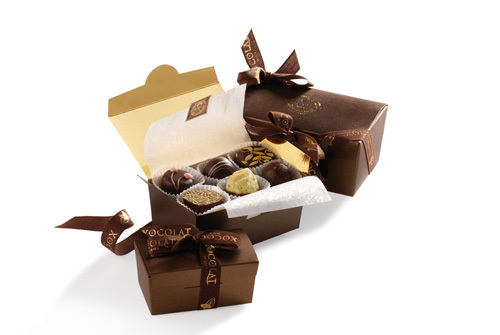 From chocolate caviar to chocolate cigars, there are plenty of great gift ideas, not forgetting beautifully illustrated praline boxes. Finally there is a solution for spontaneous gift givers who still want to make a lastingly sweet impression on their valentine. Blühendes Konfekt (literally “blooming confection”) offers pralines with candied seasonal blossoms, freshly made and packaged into “bouquets.” You can pick them up directly from the workshop or even order them online and get them delivered straight to the object of your desire by foodora.at. Vienna best and most bedazzled candy dealers could provide your perfect Valentine gift. Hey Austria, if you’re Hungary, Czech This out!